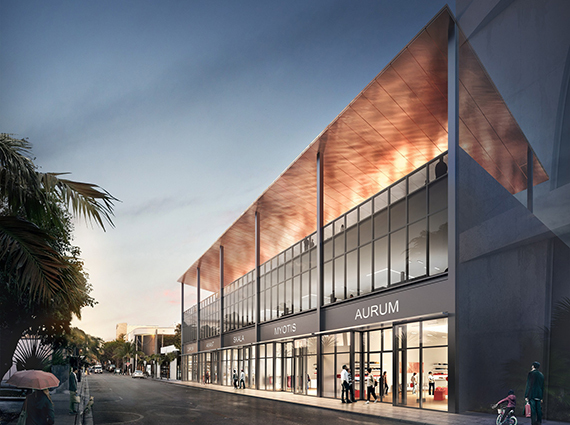 Thor Equities has filed its plans for the former post office in Miami’s Design District, proposing a three-story modern retail building that includes a rooftop deck. New York-based Thor bought the U.S. Post Office at 70 Northeast 39th Street in December 2015, paying $43.2 million or $1,409 per square foot for the land. The existing two-story, 12,972-square-foot building was built in 1947, records show. It sits on a 30,660-square-foot lot. The building had last been purchased in the 1960s for $300,000. Now, Thor plans a 57,961-square-foot building designed by Touzet Studio, plans filed with the city of Miami on Friday reveal. The building will have a ground floor, second floor and third-floor rooftop deck. It will have space for six retail tenants, plus 26 parking spaces. The number of retail tenants could end up being more or less, depending on retail demand, a source familiar with the plans told The Real Deal. The proposal even includes details of the landscaping, which will be adorned with silver buttonwood trees, gumbo limbo trees and “graceful bamboo.” Thor, led by Joseph Sitt, has been particularly active in the Design District as well as in Wynwood and South Beach. In addition to 70 Northeast 39th Street, Thor currently also owns the property at 120 Northeast 39th Street. In February, Thor sold eight sites, totaling nearly two-blocks, to Redsky Capital and JZ Capital Partners for $128.285 million. In January, Thor doubled its investment when it sold four other properties to Redsky and JZ in the Design District for $60 million. The Design District is becoming a luxury retail destination. By next year, the 10-square-block district is expected to have 160 luxury-brand stores, a boutique hotel, 15 to 20 restaurants, luxury residential condos and lofts, galleries, furniture showrooms, as well as large-scale public art, design and graphic art installations. Dacra President and CEO Craig Robins has led the area’s transformation, which included the opening of a new Hermès of Paris’ flagship store last year. Robins said in November that commercial rents are about $150 per square foot, blended, for three stories.